NBS Solicitors is a small firm based in Bradford’s city centre that specialises exclusively in UK Immigration, Nationality & Asylum Law. It is run by solicitor Mr Nigel Vaughan who has spent over a decade helping his clients navigate the increasingly complex and punishing UK Immigration system. Your first consultation with us, whether it is at our twice-weekly Drop-in or at a pre-arranged appointment, is free. For more information about the services we provide and our fees, please Contact Us. 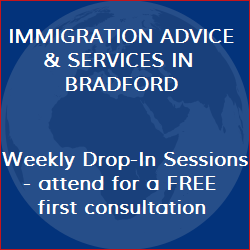 Our free drop-in service is run by Nigel Vaughan, a solicitor with over a decade of experience working in UK Immigration Law. There are no Drop-in sessions currently scheduled.